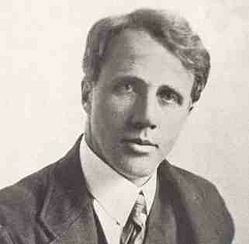 Robert Frost was born on March 26, 1874. During his lifetime he had a ton of failed jobs, dropped out of Harvard and suffered through the deaths of his children and wife. In 1912, Frost published his first book of poetry, which was reviewed favorably other famous poets, Ezra Pound and Edward Thomas. Frost credits Thomas as inspiration for his most famous poem “The Road Not Taken” (seen below). Over the course of his life, he earned more than 40 honorary degrees and won the Pulitzer Prize for his books New Hampshire, Collected Poems, A Further Range and A Witness Tree. At Kennedy’s inauguration not wanting to slip, trip and fall, he decided to recite a poem he committed to memory, rather than attempt to read the original that he had written. He died on January 29, 1963, from complications related to prostate surgery. His ashes were interred in a family plot in Bennington, Vermont.